Ok, I’ve had a mish-mash of home automation gear for a while. Z-wave, Lutron, zigbee, X10, etc. No doubt some of it is incorrectly configured. But I’m willing to reset things and start from scratch, from time to time. What should I set up first? Or perhaps it’s better asked, if I have a working ST v2 hub then how should I reset the Hue bridge and its devices to have them ‘properly’ integrated with the ST zigbee network. I ask this not just for my own setup but in preparation of using a v2 ST hub at an elderly mother-in-law’s house. She’s got a bunch of Hue lights (A19 bulbs, BR30 spots and a Bloom) all tied into a v2 Philips bridge. There’s a couple of lights that don’t always make a proper connection and I’m thinking it’s due to the spread-out floorplan and the brick-on-block construction of her house. The ones that go in/out are up in metal under-eave light fixtures outside. RF, metal, brick and distance all add up to potential coverage issues. The house is an hour plane ride away and she’s a not-very-tech-savvy 82-year-old. So it’s not like I can do a lot of debugging. I’m thinking a Samsung outlet module here or there might help extend the zigbee coverage a little more effectively. But, near as I can tell, that without an ST hub being present there’s no way to get the outlet added, as the Hue software has no support for it. But let me ask, will the Samsung outlet even help the Hue devices? Or are they not using the same zigbee configuration/profile/whatever? If you are keeping the Hue bulbs on the Hue bridge, then this won’t help. The Hue bulbs will continue to talk to their own bridge. If you are willing to take them off the Hue bridge and connect directly to the ST bridge, then someone may be able to give a definitive answer on how well that works (keeping in mind it is a pain to reset the zigbee bulbs when not connected to their original hub - you need to buy a remote capable of doing so usually). What’re the up/downsides to having the bulbs stay on the Philips hub vs paired to the ST? While I may “do more” with my own automation setup, the one at the MIL’s house is going to remain pretty basic. Just turn her lights on/off with sunrise/sunset and potentially some motion sensing for lighting in the basement. Thus using an ST hub, if only because the lack of ANY motion sensing or location-based scheduling in the Philips Hue realm. The thing I’m missing is whether the Samsung outlet will do anything to help the Hue bulb coverage. And whether it’ll do that while they’re still on the Philips hub, or if they “HAVE TO BE” on the ST hub. It won’t do it while they are still on the Hue hub. It SHOULD help if they are connected directly to the ST hub, but I can’t say it will 100% as I don’t have my bulbs directly connected to ST. The upsides to keeping the bulbs on the Hue hub are that it makes them easier to manage and replace. You can continue using the Hue app and any 3rd party apps out there for Hue bulb manipulation. The downside to keeping the Hue hub are using an extra power outlet and network port due to having 2 hubs instead of just 1. The upsides to pairing them to the ST hub mainly just include the fact you get 1 power outlet and 1 network port back to be used for other things. It’s 1 less hub to deal with. The downside to pairing them to ST is needing to add a controller to reset the bulbs. The easiest way to add coverage using the existing hub is to add more bulbs. Even if it’s just a small table lamp on a desk in a hallway to help out. The Hue White bulbs are about $15, so it’s certainly more cost effective to add a few of those in to the deadzones than to spend $150 on a hub and outlet. If there is a need to add the ST hub (you mentioned possibly adding some motion sensing in the basement), then it might be worth investigating. Otherwise, just light the place up with more Hue bulbs to extend coverage. I hear you regarding use of bulbs as extenders. Trouble is there’s not a lot of places where I could put the bulbs that would allow their use as an extender. As in, the sockets would get turned off/on manually, thus losing power to the bulb. This is an age-old automation problem and not a discussion I intend to raise (or have) here. Where as I could get away with sticking something into an outlet and leaving it there “because it helps the lights work better”. Sometimes there’s a round-about way you have to approach residential automation. The ease of management and use is the key driver for keeping the bulbs on the Hue bridge. Their software ‘works’ and various third party tools likewise. That and Siri and Amazon Echo integration without a lot of trouble. Make no mistake, I’m not dismissing use of the ST hub for any of this. I’m just trying to more clearly identify what is or isn’t possible with all this stuff today, in the real world. After some more research, even adding the bulbs directly will not give you range extending. Hue bulbs use Zigbee Light Link, not Zigbee Home Automation protocol. Here’s a post regarding this. Thanks for that Brian, I’d read something similar to that some time ago. The whole zigbee-but-which-profile aspect does certainly complicate matters. So while this is very likely the wrong place to ask, does anyone currently offer a non-bulb device that would extend the mini network that Hue devices on a Hue hub would be using? I think the only non-traditional bulb options would be adding some of the Friends of Hue items like Bloom, Iris, Go, etc. 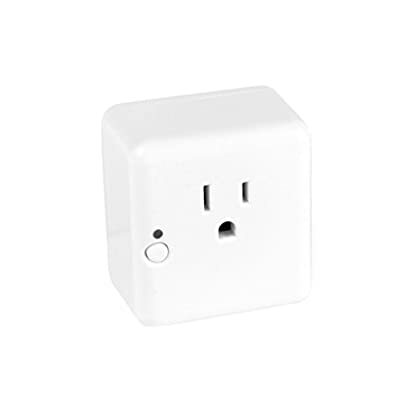 They do plug into outlets so they are powered constantly, even when off. Bloom has been on sale for $60 each. Hi ! This idea to put some friends of hue to extend works?? ?